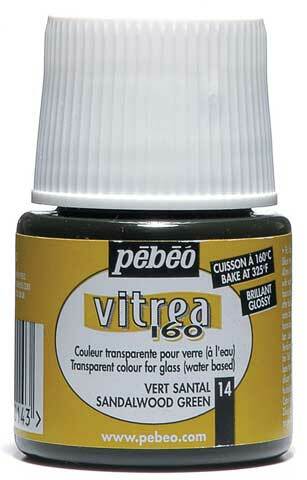 The intense bright colors in these water-based non-toxic glass paints give the appearance of expensive fused glass. They are transparent, self leveling, permanent when baked, microwave and dishwasher safe and solvent resistant. All painting techniques work well with Vitrea 160 including: stenciling, sponging, marbling, stroke work and airbrushing. The available mediums provide for real glass effects including frosting, crackling and iridescence. In 45ml bottles unless specified otherwise.